This study provides insight into preservice teachers’ experiences with integrating technology into lessons with children who had mild learning disabilities. Participants included 14 junior early childhood education majors enrolled in a special education course with a fieldwork component. The researchers collected and analyzed lesson plans, journal entries, focus group interviews, and field notes. The findings illustrated preservice teachers’ use of iPad apps during fieldwork, identified their technology-related instructional decisions, and determined how those choices exhibited emerging dimensions of technological, pedagogical, and content knowledge (TPACK). The preservice teachers combined their knowledge of pedagogy, student understanding of content, and emerging knowledge of iPad apps to effectively develop and conduct lessons in various content areas. Interviews with the students supported the social validity of the iPad implementation. Technology holds great promise for students with disabilities. Appropriate integration of technology can potentially be a great equalizer in an inclusive or special education classroom, since it can engage and motivate learners, offer alternative representations of curriculum, provide options for students to express their knowledge in unique ways, and support differentiated instruction that meets the individual needs of students with disabilities (Courduff, Szapkiw & Wendt, 2016; Pace & Blue, 2010; Smith & Okolo, 2010). Recently, the influx of iPads into schools has generated new possibilities for applying technology in various educational settings (Maher, 2013). The iPad’s portability, touch-screen interface, ease of use, and adaptability promote opportunities to foster communication, interaction, engagement, independence, creativity, achievement, and motivation in children with disabilities (Flewitt, Kucirkova, & Messer, 2014; Flewitt, Messer, & Kucirkova, 2015; Rodriguez, Strnadova, & Cummings, 2013). Research on the effectiveness of mobile apps is limited and not all apps are educationally sound, however (King-Sears & Evmenova, 2007; Maich & Hall, 2016; Northrop & Killeen, 2013). Using technology in isolation is unlikely to lead to student achievement, but special education teachers can provide effective technology-based interventions by combining evidence-based pedagogical practices with complementary technologies suited to learners’ individual needs and goals (Kennedy & Deshler, 2010; Smith & Okolo, 2010). The standards for beginning special education professionals state that they should be able to “use technologies to support instructional assessment, planning, and delivery for individuals with exceptionality” (Council for Exceptional Children, 2012, p. 6). Unfortunately, inadequate teacher preparation often inhibits teachers’ abilities to successfully implement technology along with effective pedagogy to promote learning and enhance the functioning of students with disabilities (Marino, Sameshina, & Beecher, 2009; Silver-Pacuilla, 2006). Thus, teacher education programs should provide prospective teachers with experiences that help them develop their ability to use technology effectively in special education contexts (Courduff et al., 2016; Marino et al., 2009). The technology, pedagogy, and content knowledge (TPACK) model offers a framework that teacher educators can use to determine how to help preservice special education teachers learn to make effective decisions regarding integrating technology into instruction (Lyublinskaya & Tournaki, 2014; Tournaki & Lyublinskaya, 2014). The model provides a way to identify the varied and unique types of knowledge that teachers need to develop in order to integrate technology effectively. Although an extensive body of literature documents the theoretical and practical implications of this model in general education settings (Koehler, Mishra & Cain, 2013), few studies have explored its application with teachers in special education contexts. Thus, we investigated prospective special education teachers’ instructional decision-making through the lens of the TPACK model. The primary purpose of the study was to identify the decisions that preservice special education teachers made and the types of knowledge they used when making these decisions as they integrated iPad apps into lessons with students who had mild disabilities. Secondarily, we sought to determine the participants’ perceptions of the iPad implementation process. Educators should select appropriate instructional activities and materials, including technology, based on factors such as curriculum standards, students’ needs, preferences, prior knowledge, and skill levels, and effective pedagogical practices and contextual factors such as time and available resources (Harris & Hofer, 2009; Kennedy & Deshler, 2010; King-Sears & Emenova, 2007). The technology selected should not stand alone or be used in isolation, but rather should be used along with a logical sequence of activities that provide students with various opportunities to learn and practice instructional content (King-Sears & Emenova, 2007; Northrop & Killeen, 2013). While conducting technology-enhanced instruction, teachers should monitor students’ responses to determine whether the instructional activity is effective and to make in-the-moment, as well as post-instructional decisions for future lessons, to adjust instruction to promote student success (Kennedy & Deshler, 2010; King-Sears & Evmenova, 2007). Teachers need to select and utilize effective pedagogical strategies and technologies that are appropriate for the content and context. When integrating technology, educators may legitimately consider and select from a variety of pedagogical approaches that range from teacher-directed to student-centered (Harris, 2005; Koehler et al., 2013; Magliaro, Lockee, & Burton, 2005). Special educators can use the knowledge base on effective instruction to select technology applications that align with evidence-based instructional practices (Kennedy & Deshler, 2010; Smith & Okolo, 2010). Using evidence-based practices is critical for the success of technology-enhanced approaches for teaching students with disabilities (Kennedy & Deschler, 2010; Smith & Okolo, 2010). While educational technology leaders often favor student-centered or constructivist approaches to technology integration, teacher-directed approaches, such as explicit instruction, are appropriate for technology-enhanced learning in special education settings (Magliaro et al., 2005; Smith & Okolo, 2010). An extensive body of research supports the effectiveness of the elements of explicit instruction for teaching a variety of students, including those with learning difficulties (Archer & Hughes, 2011; Kroesbergen & Van Luit, 2003; Vaughn, Gersten, & Chard, 2000). Explicit instruction promotes high levels of engagement and success and is, therefore, appropriate for students learning basic skills, particularly when they have a history of failure and inadequate background knowledge (Archer, 2013; Magliaro et al., 2005). Components of explicit instruction include reviewing prior knowledge, adjusting the level of task difficulty, breaking down new material into small parts, providing clear descriptions, models, and examples of a skill, supporting sufficient amounts of practice, giving timely feedback, monitoring progress, and gradually withdrawing support as students become proficient. Features of explicit instruction, such as clear structure, opportunities for review, practice, immediate feedback, and progress monitoring, are integral to some technology applications, such as drill-and practice-software or apps (Magliaro et al., 2005; Maich & Hall, 2016; Smith & Okolo, 2010). When these features are not present within the technology, teachers can provide them. They can do so most easily in small group or one-on-one contexts. For example, researchers illustrated how they used an iPad app in combination with explicit teaching strategies while tutoring two students (Northrop & Killeen, 2013). They taught the concept without the iPad, explained and modeled the app, provided guided practice, and finally, allowed the student to practice independently with the app. The researchers determined that differentiated instruction, guidance, and feedback were essential to students‘ learning. Implementing technology-integrated instruction involves “three way” interactions among teachers, students, and technology (Bull, Bull, & Harris, 1990). While engaging in interactions, teachers make in-the-moment decisions to adapt instruction based upon students’ performance in relation to their instructional needs and goals (Griffith, Bauml, & Barksdale, 2015). For example, while guiding students through the learning process, teachers make decisions about components of explicit instruction, such as deciding how and when to provide prompts or feedback when students make errors (King-Sears & Evmenova, 2007). In-the-moment decisions may vary by context. During reading instruction teachers made decisions that focused upon motivation, engagement, and comprehension across contexts, but made additional types of decisions during small group lessons that allowed them to customize instruction to individual student needs (Griffith et al, 2015). These other kinds of decisions related to assessment, modeling, thinking aloud, prompting, noticing, praising, and teaching problem solving strategies. Teachers develop situated knowledge through experience that informs future instructional decisions (Angeli & Valanides, 2009). Providing prospective special education teachers with opportunities to integrate technology and, thereby, to experience interactions and related decisions may help them develop the knowledge needed to make effective choices when using technology with students in the future (Marino et al., 2009). Lee Shulman (1986, 1987) originally proposed a model for representing the types of knowledge that form the basis for teachers’ choices and actions. He asserted that in addition to knowing generally effective instructional practices, teachers also needed to know how to transform content knowledge while adapting their teaching strategies in relation to variations in students’ abilities and backgrounds. He defined this pedagogical content knowledge (PCK) as “the ways of representing and formulating a subject that make it comprehensible to others” (1986, p. 9). While scholars have described PCK in a variety of ways, many of the researchers who extended Shulman’s work included the following two elements of PCK: (a) knowledge of students’ understanding of conceptions and content-related difficulties and (b) knowledge of instructional strategies and representations of subject matter likely to improve students’ understanding of content (Angeli & Valanides, 2009; Graham, Borup, & Smith, 2012; Park & Oliver, 2008). Some researchers have also included knowledge of curriculum or media as components of PCK (Park & Oliver, 2008), but Shulman did not do so. He did acknowledge, however, that teachers should be aware of curricular alternatives (e.g., instructional materials and programs) that could be used in instruction and that they should tailor the materials to specific students based on relevant attributes such as “conceptions, misconceptions, expectations, motives, difficulties, or strategies” (Shulman, 1987, p. 17). Research suggests that teaching experience involving interactions with students and context play key roles in developing PCK in teachers (Angeli & Valanides, 2009). The results of one study showed that “complimentary and ongoing readjustment” of the integrated PCK components while planning, conducting, and reflecting on instruction strengthened science teachers’ PCK (Park & Oliver, 2008, p. 280). When encountering a challenging situation during teaching, teachers used components of PCK as “knowledge in action” to determine an appropriate response. They also used “knowledge on action” when reflecting on lessons and planning subsequent instruction accordingly. Another study indicated that interactions among teachers’ developing knowledge of curricular goals and objectives, instructional strategies, assessment practices, and judgements of students’ comprehension, motivation, and abilities promoted growth in science teachers’ PCK (Henze, van Driel, & Verloop, 2008). The TPACK model extends conceptions of PCK by adding technology as a specific type of teacher knowledge (Koehler et al., 2013; Mishra & Koehler, 2006). Since Shulman originally proposed the notion of PCK, technology has become much more prevalent and complex. The extensive knowledge needed to use it effectively in teaching goes beyond the original concept of PCK. Emerging technologies, in particular, are the focus of this added domain, because they are relatively new and their function may be unclear. Furthermore, they tend to be complex, change frequently, and can be used in many different ways (Brantley-Dias & Ertmer, 2013; Cox & Graham, 2009; Koehler et al., 2013). Thus, new technologies require teachers to spend considerable time learning about them and thinking about how to use them. In contrast, traditional and ubiquitous instructional materials, such as books and videos, are more transparent, familiar, simple, and stable, and thus, do not require as much thought. TPACK can be described as teachers’ knowledge of when, where, and how to use technology, while guiding students to increase their knowledge and skills in particular content areas using appropriate pedagogical approaches (Brantley-Dias & Ertmer, 2013; Niess, 2011). When making instructional decisions, teachers strategically combine knowledge from multiple subdomains (Niess, 2011). 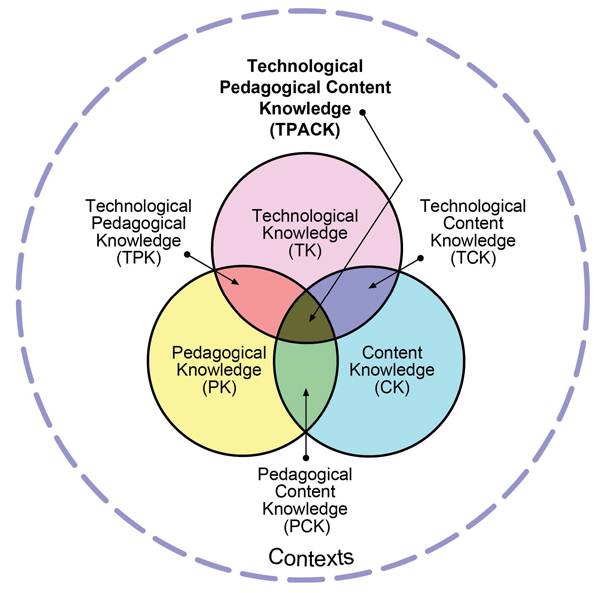 The TPACK model emphasizes the importance of complex interactions among three domains—technological (TK), pedagogical (PK), and content knowledge (CK)—needed by teachers to successfully integrate technology into instruction (Koehler et al., 2013). Figure 1 displays the original TPACK model, and Appendix A shows definitions of each of the TPACK components. Figure 1. The TPACK Model. Reproduced with permission of the publisher, © 2012 from tpack.org. Scholars have criticized the TPACK model because of difficulties with measuring the components due to inconsistent definitions of, and unclear boundaries between, the domains (Angeli & Valanides, 2009; Brantley-Dias & Ertmer, 2013; Cox & Graham, 2009). Some researchers have suggested that the model should be simplified, since its many parts are difficult to discern (Brantley-Dias & Ertmer, 2013). Though many researchers have considered TPACK holistically without distinguishing among the various subdomains, others have treated each area as distinct and have sought to clarify boundaries among the parts (Hofer & Harris, 2012). For instance, some researchers distinguished between TPK and TPACK by considering whether a technology integration practice was applicable across content areas (TPK) or pertained to instructional methods specific to particular subject matter (Cox & Graham, 2009; Graham et al., 2012). Unfortunately, since researchers have defined various domains differently, inconsistencies in findings are inevitable. In addition, some researchers have been unable to detect sufficient evidence of each domain. For example, in studies of in-service teachers, researchers have observed TPK much more frequently than TCK (Hofer & Harris, 2012). Finally, some scholars have questioned how teachers’ knowledge of students fits into the model (Harris, van Olphen, & Hofer, 2013). Experts usually consider knowledge of students to be part of PCK; however, Angeli and Valanides (2009) created an alternate version of the TPACK model, which adds teachers’ knowledge of students (e.g., their characteristics and preconceptions) as a separate domain. The interaction among the TPACK model’s domains may vary depending on the content area and other contextual factors that affect teaching and learning (Brantley-Dias & Ertmer, 2013; Koehler et al., 2013; Niess, 2011). Context is represented by the dotted circular line that surrounds the TPACK diagram in Figure 1. TPACK may be influenced by contextual factors such as grade level, curricular standards, student characteristics and background, instructional and social interactions, teacher motivation and beliefs, classroom layout, school-related expectations, support for technology, and types of technology available (Mishra & Koehler, 2006; Rosenberg & Koehler, 2015). For example, two science teachers used TPACK to make instructional decisions based on combined knowledge of materials, students’ skills and understandings, and activities that could support students’ learning of specific content (Otrel-Cass, Khoo, & Cowie, 2012). In one instance, both teachers used videos for assessment but made different decisions about how to do so based upon the unique characteristics of their students. In turn, they used the assessment data to make planning decisions for subsequent lessons. Such attention to factors that influence teacher decision making while integrating technology can strengthen our understanding of how teachers’ TPACK varies across different settings and with different students. While there is a great deal of research on the TPACK model in general education settings, research regarding TPACK in special education contexts is scarce. Only a few studies to date have investigated the application of the TPACK model in special education settings. Other studies of preservice teachers’ decision making have used the TPACK framework as a basis for understanding their choices when completing design tasks during educational technology courses or during fieldwork experiences in general education classrooms. TPACK in Special Education. In one study, the researchers investigated the process in which exemplary technology-using special educators effectively implemented technology in their classrooms (Courduff et al., 2016). When selecting technology, the teachers considered learning objectives, observed students’ preferences, and assessed academic needs. They focused more on these individual student characteristics and goals than on content. They also thought about whether the technology was appropriate for their students’ skill levels. The teachers saw technology as a way to provide their students with differentiated, active, engaging, and multisensory learning experiences. They judged the effectiveness of technology integration by observing student engagement, progress toward academic goals, and perceptions of ease of use and utility. The teachers provided instruction and support so that their students could master the content and the technology. They allowed students time to explore and play with technology so that they could develop confidence and ownership of their learning. By gradually experimenting with technology and continuing to use applications that proved effective, the teachers learned to seamlessly weave technology into their teaching, sometimes by planning ahead and other times by using it spontaneously to meet students’ needs in the moment. Prospective special education teachers, on the other hand, are just beginning to develop the skills and knowledge needed to implement technology effectively. In a series of studies, researchers investigated the growth of preservice special education teachers’ TPACK during a graduate-level course about teaching mathematics and science to learners with disabilities. Participants designed, implemented, and reflected upon two technology-integrated lessons (one in math and one in science) that they taught to students with disabilities. Results of pre- and posttest surveys indicated that the participants’ perceived knowledge increased significantly in all integrated domains of the TPACK model (Tournaki & Lyublinskaya, 2014). In addition, the researchers evaluated the preservice teachers’ lesson plans using the TPACK Levels Rubric and observed significantly increased scores during the semester (Lyublinskaya & Tournaki, 2014). Another study examined prospective special educators’ implementation of technology during an afterschool tutorial program for middle school students with disabilities (Pace & Blue, 2010). The participants worked one-on-one with students in literacy and math to address the individual needs and interests of the students. They chose to use technology in various ways to represent content, make accommodations, provide additional practice, and assess knowledge. More than a third of the preservice teachers felt that technology actively engaged and motivated their students. Some preservice teachers thought that incorporating technology was difficult and that finding just the right resource was challenging. Others learned the importance of vetting resources to identify potential problems ahead of time. Preservice Teachers’ Decision Making. While many studies have investigated the development of preservice teachers’ TPACK, few have used the framework as a basis for understanding preservice teachers’ decisions in relation to technology-integration experiences (Graham et al., 2012; Hofer & Harris, 2012). In one such study, the researchers analyzed preservice teachers’ rationales for technology-integration decisions while taking an educational technology course. Elementary teacher candidates explained how they would integrate technology in three design tasks that addressed specific curriculum standards. Results indicated significant growth in the domains of TK, TPK, and TPACK during the semester (Graham et al., 2012). However, the researchers did not find TCK in their data. In another study, preservice teachers engaged in two design tasks while taking an instructional technology course. These tasks required students to make planning decisions while designing technology-enhanced learning activities on a topic of their choice. Results indicated that preservice teachers’ scores on the design tasks increased from the first task to the second one, reflecting an increase in TPACK during the semester (Angeli & Valenides, 2009). However, the preservice teachers in these two studies did not actually implement the design tasks. Some studies have investigated preservice teachers’ emerging TPACK while making decisions about using technology in various content areas during field experiences in general education settings. These studies provide examples of specific kinds of actions that demonstrate components of preservice teachers’ TPACK in different contexts. For instance, in one study, preservice teachers enrolled in a 2-year master’s program used educational technology to support inquiry-based science instruction during student teaching (Maeng, Mulvey, Smetana, & Bell, 2013). Participants drew upon TPACK when selecting which technology to use and determining how and when to use it to support inquiry-oriented activities. They used their knowledge of science content and pedagogy when selecting and using images, videos, probeware, and simulations at appropriate times during instruction to engage students and meet curricular objectives. In another study, researchers conducted a cross-case analysis of four preservice teachers who implemented technology in grade 4-8 science, social studies, or math lessons, with support and feedback from mentors during a seven-week practicum (Jaipal & Figg, 2010). The preservice teachers used TCK when selecting technology for instructional activities that helped students learn particular content. Instructional choices that exemplified TPK included providing models and examples, developing differentiated support materials, pairing students to work at the computer together, sequencing activities, and making back-up plans in case of technical difficulties. Finally, Maher (2013) illustrated how preservice teachers used elements of TPACK when implementing iPad apps to support learning in K-6 classrooms. Participants chose to use apps to represent and explore concepts, demonstrate procedures, provide practice, give immediate feedback, support multimodal learning, differentiate instruction, and assess understanding. Research is needed that provides insight into how educators with varying levels of experience and knowledge use TPACK to make decisions when planning for and using technology in different contexts (Cox & Graham, 2009; Maeng et al., 2013; Niess, 2011). In particular, research is needed to provide insight regarding the way TPACK is utilized in special education contexts. What decisions did preservice teachers make when integrating iPad apps into their lessons? What combinations of knowledge did they utilize when making these decisions? In addition, since the effectiveness of technology integration can influence future teaching decisions, we gathered social validity data regarding the participants’ perceptions of the iPad implementation process during the study. Fourteen junior early childhood special education majors at a private university participated in the project during two consecutive spring semesters. Ten participated in the study in the first year, and four more participated in a follow-up study during the second year. They volunteered to participate in the project for the following reasons: to motivate students through their interest in and enjoyment of technology, a desire for professional growth through learning to integrate the iPad into lessons, and an interest in determining whether iPad integration would improve teaching and learning during tutoring sessions. All of the preservice teachers had completed an educational technology course that addressed a planning process consistent with the TPACK model (Harris & Hofer, 2009). However, most participants had little experience using mobile devices (tablets or smart phones) for educational purposes. Thus, at the time, the iPad was an emerging technology. Four participants owned an iPad and used it often for multiple purposes, whereas others had previously played with an iPad occasionally. One participant had never used an iPad before. Each preservice teacher was paired with one or two students who had mild disabilities. During the first year, there were four girls and seven boys, and during the second year, there were four girls and two boys. The students were between the ages of 6 and 11 and were working on first through fourth grade curriculum, as appropriate, based upon their academic strengths and weaknesses. All of the students had been diagnosed with a learning disability and/or attention deficit hyperactivity disorder. All of the preservice teachers were enrolled in a special education course, taught by the third author, which included a 30-hour fieldwork component. The course focused on processes for teaching and assessing basic academic skills with an emphasis on explicit instruction. In addition, the participants were enrolled in an educational psychology course, as well as social studies, math, and reading methods courses. They completed approximately 3 hours of fieldwork each week at the university’s private laboratory school for children with mild disabilities. Each participant tutored one or two students. Such individualized instruction is typical in special education settings (Courduff et al., 2016). Prior to beginning the project, the preservice teachers provided a list of skill areas in which their students needed further instruction or practice. These areas included math facts, math computation, reading fluency, reading comprehension, handwriting, spelling, and grammar. The first author identified free apps for each of these topics, loaded them onto the college-owned iPads, and organized them by subject area. The preservice teachers could also request additional free apps; however, only a few of the first-year participants chose to do so. Between the first and second years of the study, the first author added more apps to the iPads, most of which were initially free or low cost. In addition, she created a database of all the apps, as suggested by the first-year participants. During an introductory session in the first year of the study, the preservice teachers discussed their students’ needs, explored iPad apps, and reviewed a rubric that they could use to evaluate the apps (Walker, 2011). The first author conducted a similar session during the second year, but modified the content based upon feedback from the first group of participants. She gave the preservice teachers a case study and asked them to find apps on the iPads that would be appropriate for the scenario. In addition, she provided resources for locating apps, including the database of all the apps on the iPads, links to two other app databases, an app evaluation rubric, and two sample mini-lesson plans. After an introductory session, the preservice teachers planned and implemented at least four lessons that incorporated iPad apps. In the first year, the project began midsemester. In the second year, the project started earlier in the semester, so that the participants would have more time to plan and implement their iPad-integrated lessons. They could check out an iPad the day before their field experience to preview apps while planning their lessons. Some preservice teachers used the borrowed iPad, while others used their own iPads during the lessons they conducted in the fieldwork setting. We collected multiple forms of data. The primary data source was focus groups held at the end of the semester. Each of focus group lasted about an hour and a half, and there were four or five participants in each of the three focus groups. The first author led the focus groups, while the other two authors took notes or asked occasional follow up questions. The interviews were audio recorded and transcribed by a professional transcriber. In addition, graduate teaching assistants conducted brief individual interviews with 11 laboratory school students during the first year. (See Appendix B for focus group and interview questions.) These interviews were recorded and transcribed by the graduate assistants. We also used several secondary data sources for clarification and contextual information. These sources included lesson plans and weekly journal entries reflecting on the lessons, which the preservice teachers submitted to an online learning management system. Finally, we observed a small subset of lessons and took field notes during these observations. Since multiple lessons occurred at the same time, and the exact time of the iPad-integrated lessons was not known in advance, we were able to see only parts of some lessons. Nevertheless, these observations provided essential background information that helped us better understand the data from other sources. The analysis focused on instructional decisions and the underlying knowledge that the preservice teachers used when making them. While we reviewed all of the data sources, we only coded and analyzed the interview data. The first two authors independently identified and coded instructional decisions mentioned in the focus group interviews using qualitative analysis methods, using Microsoft Word to color code instances of instructional decisions. The first two authors then met, discussed, and modified the coding scheme multiple times until reaching agreement in terms of the decisions identified, codes used to categorize them, and emerging themes. Later, the first two authors entered the statements related to instructional decisions into an Excel spreadsheet. This approach allowed sorting of statements by the types of decisions made. In a second round of coding, the forms of teacher knowledge (i.e., TPACK dimensions) associated with each type of instructional decision were identified. Finally, to determine the social validity of the process of using the iPads, the first author and a graduate student used a similar process to analyze transcripts from the student interviews, independently coding the transcripts and identifying five themes. The two met and discussed the instances of each theme to resolve any differences in coding. The graduate student entered the statements and their codes into an Excel spreadsheet so that they could be easily sorted by theme. Like most research, the current study has some limitations. In qualitative research, the purpose is not to generalize to different settings but to provide information that can be transferred to comparable situations and applied in analogous contexts. Readers should keep the context in mind when considering the applicability of the results to other situations. The current study took place at a private university laboratory school for students with mild disabilities. Since the 14 participants were volunteers, they may have been more motivated to use technology in teaching than were their peers. They taught single students, and sometimes pairs or small groups. While such individualized instruction is typical in special education settings, there are other situations that a special education teacher could encounter in a public school setting (e.g., coteaching or inclusion). Furthermore, participants used only one kind of emerging technology. The advantage of using iPads was that the devices could be easily transported to the school setting, and thus, we did not need to rely on the school’s technology. The preservice teachers used the iPads primarily as instructional technology (a means to facilitate learning for students with and without disabilities). Participants generally did not use the iPads as assistive technology (to improve the functional performance of students with disabilities). Thus, the study did not address the full range of technology applications used in special education contexts. In addition, there are some limitations to using focus groups for data collection. While focus groups are an efficient way to collect data, they do not provide as much raw data as do individual interviews. For example, in the group setting, sometimes one participant would make a statement, and then the other participants would simply nod their heads in agreement. Although we noted these occurrences, they did not allow us to quantify the prevalence of different types of statements. Nevertheless, we identified representative quotes that illustrated the participants’ shared experiences. Another limitation is that the interviews occurred late in the semester, and the participants may not have been able to accurately recall decisions that occurred earlier in the term. However, data from other sources (i.e., lesson plans, journals, and observations) provided a fuller picture of the preservice teachers’ thoughts and actions while planning for and implementing iPad apps in the tutoring sessions. We identified two primary kinds of teaching decisions: planning and in-the-moment (although occasionally we could not be certain whether a decision was made spontaneously or while planning the lesson). Some of the preservice teachers’ decisions occurred prior to instruction, such as those associated with planning lessons, sequencing activities, and selecting iPad apps. Decisions made during instruction often occurred in the context of three-way interactions between the preservice teachers, their students, and the technology. Usually these in-the-moment decisions were in response to student actions, as well as technological issues that occurred. Decisions made during instruction involved monitoring progress, providing review, feedback, and extra practice, adjusting difficulty, offering support, providing modeling and guidance, withdrawing assistance, managing behavior, and dealing with technical problems. Our analysis suggests that the preservice teachers drew upon two main categories of combined knowledge when making decisions. Decisions that were based upon TPK required combined knowledge of technology (i.e., iPads and apps), plus knowledge of appropriate pedagogical methods (i.e., explicit instruction) or management tactics. These generic pedagogical strategies were independent of content, because they could be used across various content areas (Cox & Graham, 2009; Graham et al., 2012). Like Jaipal-Jamani and Figg (2015), we considered TPACK as primarily a combination of PCK with TK (or TPK). Decisions based on TPACK utilized integrated knowledge of technology and appropriate pedagogy (i.e., explicit instruction) for teaching specific content knowledge. When making these decisions, participants also drew upon their knowledge of students’ instructional needs and characteristics, an element of PCK, in relation to the content and skills students were expected to master. Since teachers may base their decisions on different combinations of knowledge depending on the context, we developed Figure 2 to illustrate how the preservice teachers displayed elements of TPACK while using iPad apps in a special education setting. The primary types of combined knowledge (TPK and TPACK) are bolded to highlight the domains reflected in the data. Figure 2. A TPACK model depicting the knowledge underlying preservice teachers’ decisions while using iPad apps in a special education setting. Since we did not observe TCK in isolation, we arranged the overlapping circles in such a way that it is omitted. The grey areas indicate underlying domains (PK, CK, TK, PCK) that we inferred from the data but were not reflected in the focus group discussions. For example, the preservice teachers had to know the content they were teaching (CK) and how to operate an iPad (TK). However, they did not make statements that reflected this underlying knowledge. The circles for TK, PK, and CK are not the same size, reflecting the approximate relative contribution of each domain. The largest circle (PK) reflects the emphasis on pedagogy (i.e., explicit instruction) embedded in the course in which the students were enrolled. The TK circle was the smallest, since the preservice teachers were just beginning to learn about using iPads and educational apps. Decisions related to selecting apps and planning lessons that incorporated them were primarily based upon TPACK. Such decisions required the preservice teachers to combine their PK about explicit instruction, awareness of students’ content knowledge and instructional needs, and emerging TK of implementing iPads and apps. The iPad apps alone couldn’t constitute a whole lesson. I feel like we all added and supplemented to it to provide some structured form of instruction so the students are learning the content and then applying it to the iPad app. Ramona echoed Erica’s statement by saying, “A lot of [apps] are really good for warm-up practices… or an introduction or just a part of the lesson, but I couldn’t…plan a lesson and only use the iPad.” In these comments, participants acknowledged that the iPad apps could support certain pedagogical components, and while specific content was not mentioned, we know from the students’ lesson plans that each was designed to meet particular content-related goals. At first glance it seems like, oh, you’re using an iPad, that’s like an easy way to plan a lesson, but it was actually really challenging….You [had] to incorporate a lot of different resources and make sure that the app was appropriate and bring your own instruction into it….So, I was surprised by that. Selecting Apps. The preservice teachers were sometimes overwhelmed by the process of selecting apps that matched learner needs and effective pedagogical methods. Participants collectively mentioned at least 30 different apps in their lesson plans, journals, and focus group interviews. Table 1 lists several commonly used apps, describes how the preservice teachers used them, and notes the students’ responses to the app. The preservice teachers identified several reasons that app selection proved challenging: (a) there were many apps to choose from and app reviews were not always helpful; (b) many apps did not match the needs or levels of the students; and (c) apps did not always adequately address content matter. Inspiration Participants used the app as a planning tool for writing a story. Preservice teachers needed to provide some guidance and allow time for students to learn to use it successfully. The boys working together had difficulty sharing. One student said this was his favorite lesson. Mad Libs Preservice teachers used this app to provide students with practice on parts of speech. Students found this app to be fun and engaging. The app does not provide corrections, so the teacher must monitor student responses and provide feedback to indicate if word choice is appropriate. Sushi Monster Participants used this app to provide practice in addition or multiplication. Students generally enjoyed using the app. However, there was a big jump in difficulty between levels, so some students struggled with more difficult equations. Also, there was no corrective feedback for errors. The Opposites Preservice teachers used the app to provide practice identifying opposite words (individually, or in pairs or groups). Students were engaged in playing the game. The first two levels were easy, and then there was a big jump in difficulty. Some students had trouble with the fast pace of the game or with reading more difficult words independently. I think it was just you had to keep your specific student in mind and what your goal was. You always had to have that in mind because some games were fun, but you’re like, “Well, they’re not getting much out of it,” or it goes too fast for your student. When we did animal adaptations, he drew an animal with that adaptation…I found that really effective because I didn’t have to bring paint and markers and all that stuff. He could just do it right there in the moment. She really understood on the paper, and so when I gave her the app and I explained it, she was doing it, but she was missing them all on the app. So one thing I had to do…is I actually did it again the next week, but I made another lesson using manipulatives doing the missing addend. So I used that one kind of as an assessment at first. The student’s performance using the app indicated that he did not generalize the skill from one situation to another. Thus, Kelly planned another lesson to reinforce the students’ understanding of missing addends. She then incorporated the app into a subsequent lesson, and the student performed much better. …You can enter in any word that if they don’t know why they’re entering the word or what the words mean, then it kind of defeats the purpose of a learning tool. So, I taught parts of speech and then we did the Mad Libs to practice. I would try to get in the habit of pausing it and then going to the whiteboard and looking at the ones she got wrong, and so I think the apps that provided the right answer right after or quickly—you could go back and look at the right answer, review it without the time pressure—really helped my student. Allison also considered the characteristics of the Spelling City app in relation to the explicit instruction model and then had her student engage in additional practice after using the app, based upon her observations of her student’s spelling errors. The app itself was just really explicit. It said the word. It said it in a sentence. It modeled it. He got to do it, and then it gave him his corrections at the end….I had him draw on a whiteboard, and we practiced spelling that word, and I taught that explicitly. And all the words he got wrong, by the end, after we practiced the words, he knew how to spell them….I knew he would get a lot more out of it if I did that with him rather than just him seeing, oh, I got these words wrong. Adjusting Difficulty. Some preservice teachers made decisions to adjust instruction when an app was either too difficult or not sufficiently challenging in relation to students’ content knowledge and skill level. To do this, they had to draw upon their knowledge of students’ abilities or understanding of content in relation to the difficulty level of the content presented in the app. For example, Amy wanted to be sure that the student was comfortable with the content and would not become frustrated when the difficulty level of the app increased. When her student wanted to continue to more challenging levels, she decided to write down the words that were too difficult and then, after the game was over, she went over the definitions of the words and helped the student identify an opposite word. It was almost, I think, too easy, because you just dragged the letters to make new words. So she would make the words, and then afterwards I had her write down two or three words in this word family….I just wanted to, I guess, assess whether she could then come up with her own examples. But she understands long and short [vowels]. She was able to do it once I would prompt her….I was like, “Okay, well, what does long A sound like?” And then I would read her the word or she would read the word. I was like, “Well, does that one have a long A?” “No.” She would know the answers. He was getting really frustrated because he…didn’t have time to pick the right word, but he ended up knowing it. And so last minute I decided that I was going to read the sentence to him and then read him the words and let him pick. They couldn’t really read the harder words. They were a little bit more difficult for them. But they liked it, and I could tell that they understood what opposites were. As long as I could just read the words to them, they could figure out which one it was. Sheryl also found that her students got frustrated when they knew the answers but could not keep up with the fast pace of a math app. She decided to have them do a worksheet that addressed the same skill and pointed out, “You really are capable of doing this; you’re getting it correct.” In this case, the students preferred the worksheet over the iPad, since they were more successful when working at their own pace. The preservice teachers demonstrated decision-making based upon TPK when they made statements that reflected instructional or management decisions without specifically referencing students’ content knowledge. Such decisions involved providing modeling and guidance for using apps, withdrawing assistance, managing behavior, sequencing activities, and dealing with technical difficulties. That was something I knew I was going to have to kind of figure out in that moment because I didn’t know. So they didn’t know, and so in that moment, I explained what they could do. I actually ended up…modeling my own on paper. Then I showed them how I could take mine and put it on the app. I started talking and showing her, and she was, like, “Wait a minute, wait a minute, let me do it,” and so she took over and she figured it out and it was, you know, great. I didn’t really have to keep saying stuff. I just was able to sit back and be quiet….So that was a really good learning experience, because after that with every other app that’s what I did. Preston knew how to type better, whereas John didn’t, so John would give his ideas and Preston would then type….That’s where the sharing kind of got out of hand, because John really wanted to work on the iPad, and he wanted to touch it and mess with it…and so we had John make all the bubbles and drag the screen, where Preston could type. I would tell her, “Okay. Well, we have to get through all of these things first. You have to do your best on all of this, and then we can do the iPad.” So one time my student was like, “Well, I’m doing really well today. I’m going to get to do the iPad, right?” and I was like, “Well, yeah. We’re almost to the iPad.” She would have to get through however many lessons I had before that. I usually would gauge it, but it would usually come towards the end. Since that one didn’t really work…I had two different ones, that one and the Bugsy’s. So I wasn’t sure which one would work. But since I already had another one in mind, I went ahead and used that one. So I’m sitting there frantically trying to type up some spelling words and [Dr. A] comes over and she’s, like, “Hey, what’s going on?” and I was, like, “I don’t have the spelling list” and she was, like, “Why don’t you let him make it?”….So, he ended up making it and recording his voice, and that was really good. While the current study was mainly focused on instructional decisions and the underlying knowledge upon which those decisions were made, we also wanted to determine whether the participants perceived the process of implementing the iPad apps as worthwhile. Since previous research indicated that special education teachers base their intentions to continue using technology on their students’ perceptions, engagement, and progress toward learning goals (Courduff et al., 2016), we sought to ascertain participants’ views about using iPads during lessons. To determine the social validity (i.e., impact or importance) of the iPad implementation, we examined evidence from the focus groups and student interviews. When I thought about using the iPad, I just really thought games and practicing what you just taught. So I figured I would teach a lesson and they would practice it. But then I realized that it can actually help you throughout the lesson, too. We played Mad Libs, and I thought of some verbs, adjectives, nouns, plural nouns, and adverbs, and it was fun….I also played Sushi Monster. It’s a math game, and I really liked it. And, we also played a spelling game, and, I don’t know what it’s called, but we took a spelling test, and I liked that too. It was actually different because I wasn’t using a pencil. I was using an iPad…Right now we’re doing this, we’re doing oceans…we’re gonna do something on the iPad, so, yeah. Also, the iPad has some stuff that we can’t do without the iPad. This study broadens the literature related to understanding preservice teachers’ decisions with regard to planning for and implementing technology-integrated lessons with students who have mild disabilities. Since TPACK is contextually dependent, it is important to illuminate the nature of TPACK in special education settings. Identifying practical examples of how preservice teachers use TPACK in technology-enhanced special education environments can provide teacher educators with a basis for designing experiences that can promote effective technology integration in similar learning contexts. While navigating the complex challenges of integrating technology in meaningful ways, the preservice special education teachers had multiple opportunities to practice combining technological knowledge, pedagogical knowledge, and content knowledge to make instructional decisions. The planning process required participants to carefully evaluate and select apps that aligned with the characteristics and instructional needs of individual learners and the features of explicit instruction. Furthermore, the preservice teachers blended components of this specialized knowledge to make in-the-moment teaching decisions when integrating technology into tutoring sessions. These decisions occurred in the context of three-way interactions among the preservice teachers, students, and technology. The preservice teachers mediated the interface between the students and technology, providing guidance, adaptations, and feedback as needed and withdrawing their involvement when it was not necessary or desired. Previous research suggests that teacher-student interactions help to develop PCK, and logically, that should be true for TPACK as well (Park & Oliver, 2008). Preservice teachers need many opportunities to practice designing, implementing, and reflecting upon technology-integrated lessons that address specific content areas (Maeng et al., 2013; Marino et al., 2009). When implementing these lessons, educators can develop TPACK as they adjust teaching strategies or supports in response to the needs and behaviors of their students (Jaipal-Jamani & Figg, 2015). The preservice teachers’ decisions primarily reflected either a combination of their developing technological and general pedagogical knowledge (TPK) or the intersection of technological and pedagogical content knowledge (TPACK). Like Graham et al. (2012), we found that the preservice teachers focused on general pedagogical practices (i.e., explicit instruction) applicable across content areas. Similar to Jaipal and Figg (2010), we observed TPK-related decisions associated with providing modeling and guidance (or withdrawing it, when appropriate), managing behavior, sequencing activities, and dealing with technical issues. We also identified decisions based on TPACK related to planning lessons, selecting apps, monitoring progress, adjusting difficulty, and providing review, feedback, practice, or support. In those cases, participants were primarily combining their understanding of learner content knowledge (an element of PCK) with technological knowledge (TK or TPK) when making instructional decisions. When planning lessons, the preservice teachers considered the students’ understanding of content and how technology paired with effective pedagogy could help to close the gap between what students knew and could do and what they needed to learn. The preservice teachers may have used TCK when they matched apps to the lesson content (as in Jaipal & Figg, 2010); however, they also considered pedagogy and student content knowledge when selecting apps. Thus, like other researchers, we did not identify TCK in isolation (Graham et al., 2012; Hofer & Harris, 2012). Rather, TCK was subsumed under TPACK. Knowledge of students may be particularly salient when teachers make decisions in small group and individual teaching contexts, which are common in special education settings (Courduff et al., 2016; Griffith et al., 2015). Researchers typically consider teachers’ understanding of students to be part of PK or PCK, but this knowledge component does not play a prominent role in TPACK literature (Graham et al., 2012; Harris et al., 2013; Park & Oliver, 2008). However, Angeli and Valanides (2009) created an alternate TPACK model that includes knowledge of students, acknowledging the evidence that teachers utilize their knowledge of students’ understanding of content when teaching with technology. In the current study, the preservice teachers focused on matching learner content knowledge, needs, and preferences to teaching strategies and technology. Their decisions mirrored those of exemplary technology-using special education teachers (Courduff et al, 2016). In addition, they followed a process similar to that delineated in the TECH framework, which places students’ needs and learning goals at the forefront of planning and implementing technology-enhanced instruction (King-Sears & Evmenova, 2007). Monitoring students’ learning is an important component of technology-enhanced instruction in special education (Kennedy & Deshler, 2010; King-Sears & Evmenova, 2007; Smith & Okolo, 2010). Like other researchers, we found that participants’ close observations of students’ engagement and understanding prompted teaching decisions and, hence, provided opportunities for developing teacher knowledge (Courduff et al, 2016; Park & Oliver, 2008). Since the fit between the apps and the students’ needs, abilities, and instructional goals was not always just right, the preservice teachers made in-the-moment decisions that tapped various dimensions of TPACK to promote student success. For example, participants were sensitive to situations in which the students seemed frustrated because an app was too difficult and adjusted their instruction accordingly. The preservice teachers’ observations of student responses helped to modify or validate their instructional choices, shaping their TPACK. Overall, both preservice teachers and the students with mild disabilities perceived the experience positively. The preservice teachers thought that integrating iPad apps into instruction was more challenging than anticipated. Similarly, other researchers found that searching for apps and planning complimentary activities to support learning goals can be time-consuming and overwhelming at first (Flewitt et al, 2015; Maich & Hall, 2016). Nevertheless, many of the preservice teachers felt that, overall, it was a good learning experience and that the effort was worthwhile. The students thought that using the iPad apps was fun and, though sometimes frustrating, facilitated their learning. In some cases, the apps helped students compensate for their disabilities. As other researchers have noted, observing students’ enjoyment, motivation, and engagement while using the apps encouraged the teachers to develop more learning activities that incorporated the technology (Flewitt et al, 2015). Teacher educators have implemented various strategies to prepare general education teachers to integrate technology effectively into instruction. More specific strategies to promote technology integration in special education contexts need to be developed. Previous research indicates that special education teachers can increase their ability to fluently select and implement technology by gradually and intentionally experimenting with it, while seeking effective ways to promote students’ progress (Courduff et al., 2016). Our findings suggest that technology-integrated fieldwork in a special education setting allows preservice teachers to experiment with technology and make decisions that utilize various dimensions of TPACK when planning and implementing lessons. Preservice special educators can benefit from opportunities to consider student needs, understandings, and skill levels while planning for and using technology, such as iPad apps, to promote understanding of content knowledge and skills (Courduff et al., 2016; Marino et al, 2009). The current study illustrates one way that teacher educators can provide preservice special educators with opportunities to develop the knowledge and skills they need to implement technology effectively with students who have mild disabilities. The preservice teachers practiced planning and implementing lessons that incorporated iPad apps with individual or small groups of students in a variety of content areas. Next steps would include having the preservice teachers use other kinds of technologies with larger groups of students in supportive contexts. For example, they could design and implement centers or small group activities incorporating various kinds of technology, and eventually integrate technology in lessons for a whole class. In addition, teaching prospective special educators about the specific types of decisions and actions that reflect TPACK components prevalent in special education settings can promote the use of this knowledge in teaching practice (Jaipal-Jamani & Figg, 2015). Providing models of various uses of technology in specific content areas can also broaden teachers’ TPACK. These strategies can help teacher educators to better support preservice special education teachers’ development of ways of thinking and acting needed to effectively implement technology in special education contexts. This paper was revised on July 17, 2017, to return sections of text that disappeared do to a technical glitch. Archer, A. L., & Hughes, C. A. (2011). Explicit instruction: Effective and efficient instruction. New York, NY: Guilford Press. Henze, I., van Driel, J. H., & Verllop, N. (2008). Development of experienced science teachers’ pedagogical content knowledge of models of the solar system and the universe. International Journal of Science Education. 10(13), 1321-1342. doi:10.1080/09500690802187017. Pace, D., & Blue, E. V. (2010). Cutting edge educators: Preservice teachers’ use of technology within universal design for learning framework. Insights on Learning Disabilities, 7(2), 19-29. Content Knowledge (CK) Knowing the subject matter to be learned, including the facts and structures of the content domain. Pedagogical Knowledge (PK) Understanding general principles and practices of the teaching and learning processes, including lesson planning, assessment, and classroom management. Technology Knowledge (TK) Ability to use technology for various purposes, adapt to changes in technology, and recognize when it can help or impede attainment of learning goals. Pedagogical Content Knowledge (PCK) Knowing pedagogy appropriate for teaching particular subject matter, including transforming the content for teaching and adapting instruction or materials based on students’ characteristics, skills, and knowledge. Technological Content Knowledge (TCK) Comprehending how content and technology relate to each other, including the ability to identify and match technology tools to subject-related learning outcomes. Technological Pedagogical Knowledge (TPK) Understanding the affordances and constraints of various technological tools, how their use affects teaching and learning, and how to use them in conjunction with generally applicable teaching strategies. Technology, Pedagogy, and Content Knowledge (TPACK) Combining knowledge from multiple subdomains to effectively integrate technology while guiding students to increase specific content knowledge and skills using appropriate pedagogical approaches. Note: Definitions adapted from the work of Angeli & Valanides, 2009; Brantley-Dias & Ertmer, 2013; Graham et al., 2012; Jaipal & Figg, 2010; Koehler et al., 2013; Niess, 2011). Briefly tell us about a memorable experience you had while using the iPad with your student. How did you select the apps that you used in your lessons? Think about a particular lesson that incorporated the iPad. Please describe decisions that you made while you were planning and implementing the lesson. How did lessons using the iPad compare with other lessons that did not use the iPad? How do you think using the iPad either helped or hindered your students’ learning? How did your thinking about using iPads during instruction change? Is there anything else you’d like to say about your experience using the iPads with your student? I noticed that your teacher used some iPad apps during the lessons. Tell me about that. How do you think your experience with your teacher was different than usual when you worked on the iPad? What was your favorite thing about using the iPad to complete your lessons? What was your least favorite thing about using the iPad to complete your lessons? Did using any of the iPad apps help you learn? If so, in what ways did they help? Was there anything about using the iPad that was difficult? If so, what would you change about the apps to make learning easier? Would you like to use the iPad again when working with your teacher or in your classroom? Why or why not? What else would you like to share about your experience learning with the iPad?